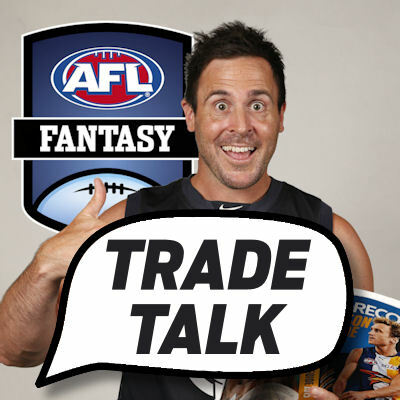 Roy’s Trade Talk is a little later than the regular Tuesday morning time slot but it’s here. Use the comments section to discuss your trade options with the DTTALK community. easily be used this week shuffling the rookie deck. A common question I am receiving is in regard to hold or fold Nick Riewolt (FWD, $659,000) and whether to hold or fold after hearing the news it might only be a 1 to 2 week injury. Despite this, it’s almost a blessing in disguise to patch up a bad rookie pick by trading Roo out to a mid priced success story (for round one at least) and bringing in someone like Jack Steele (MID/FWD, $442,000) or Touk Miller (MID/FWD, $504,000) and using the cash to upgrade to a ‘best 22’ player you may have missed like (Caleb Marchbank DEF, $226,000) or Zac Jones (DEF, $352,000). Here are some mid priced guys that we all considered, but many didn’t go through with that are great targets this week. Dyson Heppell (MID, $578,000) What an absolute champion! After looking a little off the pace in the JLT the Bombers skipper absolutely dominated with a performance for the ages, scoring 156 from 34 touches, 8 marks, 7 tackles and 3 goals. There is a serious risk the Bombers may have a flat patch at some stage soon given the emotional high that has been likened to a Premiership, but even if so, Hepp is great value. Andrew Gaff (MID,$587,000) Did exactly what we thought… Absolutely dominating with the likes of Sam Mitchell and Matthew Priddis combining as the best inside mid combination in the competition and provided endless opportunities for Gaff to record +6’s on the outside. He took a phenomenal 13 marks and gathered 36 possessions (32 uncontested) on his way to 144. Marc Murphy (MID, $510,000) looked like the Marc Murphy of old, as opposed to the one we saw last year. He didn’t miss a beat against the Tigers and it left many of us scratching our head as to how we could miss Bryce Gibbs at his price last year, only to do it again with a player who has averaged as high as 111 in the past. He has 35 touches, 6 marks and 7 tackles for a whopping 139. Jobe Watson (MID, $47,000) was one of the feel good stories (well for most of us) but especially good for the 19% of coaches who selected him after he dominated with 27 touches, 7 marks and 8 tackles for 122. He has a BE of just 52 and looks set for a sensational season. Imagine the cash we could have saved by starting with Matthew Kreuzer (RUC,$454,000) and Jarrod Witts (RUC, $352,000). Kreuz looked like the player we have all thought he could be with 39 hit outs, 2 goals and 15 possessions for 120, while Witts embraced the responsibility of sole ruck duties at his new club with 37 hit outs and 9 tackles a highlight of his 104. Both remain worthy selections, especially for those who may have taken a punt on Tom Hickey. Of the young bloods worth grabbing, unfortunately we will need to pay for it as the guys at the top of the tree such as, Andrew McGrath (DEF/MID, $276,000), Will Hoskin Elliot (FWD $258,000), Sam Powell Pepper (MID, $233,000) and even Alex Neal-Bullen (FWD/MID, $288,000) all come at a cost after great games but their job security and scoring ability make them worthwhile. Week 1 drama! No idea where to go from here. Can’t direct swap Taranto in Neal-Bullen or WHE, and not sure who else I would downgrade to find the funds. Any thoughts / advice greatly appreciated! Current side after going Roo to Miller. Thoughts on what I could do with the cash at this stage? Only thing I can think of is to upgrade some of your lesser rooks such as pickett or hibberd to better performing ones. Anyone else its too early to make a call on. Looking to go pickett -> hannan/neal-bullen, know they wont score that high again but their be’s are too irresistible to pass up.. who should I bring in?? I’m seriously considering dumping O’Meara for WHE to free up some cash in RDT early on, but I know it’d kill me to watch WHE drop to the expected 70 average and Jaeger start pumping out 95-105. That 65 in the middle of my midfield is just BUGGING me lol. Can someone please talk me out of it? Keep Treloars score as captain of 127 or take a risk with Danger or Rocky? Get in J. Kennedy (7k left), T. Miller (55k left) or J. Steele (113k left)?